Explanation: From beginning to end, different stages of a star's life appear in this exciting Hubble Space Telescope picture of the environs of galactic emission nebula NGC 3603. For the beginning, eye-catching "pillars" of glowing hydrogen at the right signal newborn stars emerging from their dense, gaseous, nurseries. 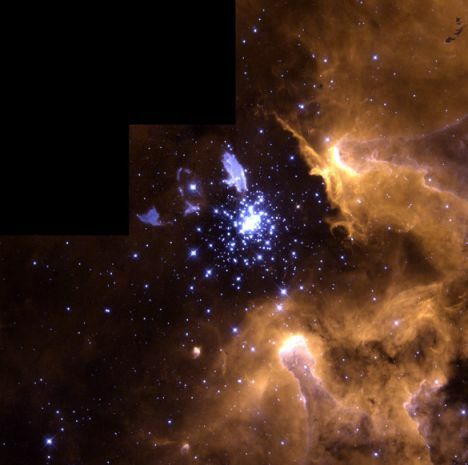 Less noticeable, dark clouds or "Bok globules" at the top right corner are likely part of a still earlier stage, prior to their collapse to form stars. At picture center lies a cluster of bright hot blue stars whose strong winds and ultraviolet radiation have cleared away nearby material. Massive and young, they will soon exhaust their nuclear fuel. Nearing the end of its life, the bright supergiant star Sher 25 is seen above and left of the cluster, surrounded by a glowing ring and flanked by ejected blobs of gas. The ring structure is reminiscent of Supernova 1987a and Sher 25 itself may be only a few thousand years from its own devastating finale. But what about planets? 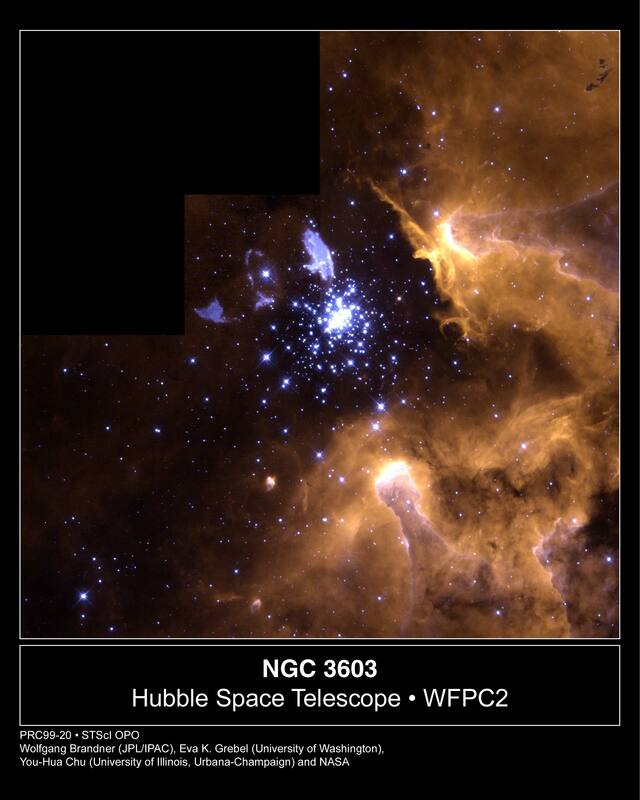 Check out the two teardrop-shaped objects below the cluster toward the bottom of the picture. Although larger, these emission nebulae are similar to suspected proto-planetary disks (proplyds) encompassing stars in the Orion Nebula.